The university library has a comprehensive collection of learning materials which include print & electronic books, exhibition catalogues, electronic journals, DVDs, audio resources and digital games. 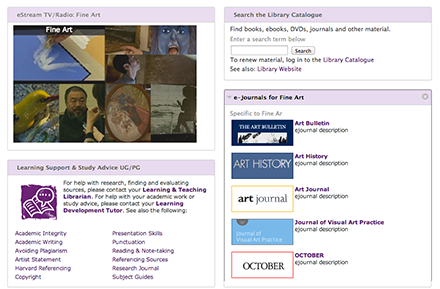 Many of these resources have been grouped into subject areas and accessed via Library Resources in the course and unit areas of myUCA – as the image above demonstrates. Easily access copyright cleared images. Staff and students can also upload and share image, audio and movie files, and request images from the Library. This resources can be useful in teaching. Access recorded television broadcasts via desktop, tablet or mobile – on or off campus, 24/7 and in-perpetuity. Use the myUCA Mashup tool to embed video directly into the learning context. View a range of University archives, special collections and artist books in digital book / page turning format – it may also be possible to digitise sketchbooks – contact the Digitisation Unit for more information. Containing a collection of visual art displaying over 100,000 images that are freely available and copyright cleared for use in learning, teaching and research in the UK.